Visio has a Revision Cloud shape on the Annotations stencil that is…well…less than adequate. (You can find it under File > Shapes > Visio Extras > Annotations.) The problem is that you don’t get more bubbles as you stretch the shape; it just looks wrong. The shapes that accompany this post utilize custom patterns. Custom patterns are elemental graphics that can repeat themselves as line or fill patterns. I won’t go into how to create custom patterns in this article, but there are several links at the end of the post that will take you to this knowledge. The new bubble shapes define a pattern that has three bumps. When you apply them to a shape, they simply repeat around the perimeter, giving you a nifty Revision Bubble! 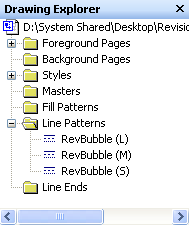 You can see where the custom bubble patterns are stored in the Visio document by clicking this menu item: View > Drawing Explorer Window, then expanding Line Patterns tree node. It’s also a good idea to apply some corner rounding if your revision shapes have a lot of sharp corners. The custom bubble pattern looks better when it goes around soft, rounded corners than when it has to be stretched around a sharp corner. There are two ways that you can increase the size of the bubbles on your shapes. 1. Apply a different bubble pattern, ie: “RevBubble (S)” for small, “RevBubble (M)” for medium, and RevBubble (L) for large. 2. Increase the line-weight of the shape. The bubbles will get bigger when you increase the line-weight of the shape, but the thickness of the bubble-lines will also increase. Of course you can mix the two, and this two-axis diagram attempts to illustrate what is going on! It’s kind of luck a Bang for the Buck chart, in that the bubble size increases as you go right or up — as you increase the pattern size or the line-weight. Hope you find these shapes useful! Need More? Have Spare Change but No Patience? Essentially the article I didn’t have to write! Unfortunately, I didn’t find this link till it was too late! This is from Dan Brown, the man who brought you the Visio Keyboard Shortcut Mousepad! 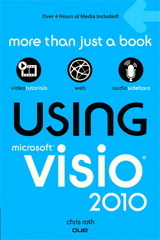 A farily-detailed article from Chapter 10 of the on-line version of Developing Visio Solutions on MSDN. A rough overview of Visio’s custom line and fill patterns from Office Online. An interesting step-by-step from Microsoft Support that shows that you can use images in your Visio custom patterns as well! I wrote this demo for Visio Corp.Â back in 1999. There’s heavy use of custom patterns in the Visio document that you might find interesting! You will have a bunch of individual arcs, and individual text blocks for each line, and each change in text formatting. This mess can be grouped together into a single shape, which should export to CAD. But now you’ve lost the nice SmartShape behavior – so it should only be done after the shape has been adjusted to its end state. I will report this to Microsoft as an issue. Thank you for this response, however we convert in Batch, sometimes upwards of 1000 files. So this will not be an effective method to transfer the bubbles one by one. These shapes are great, and make working in Visio much easier. 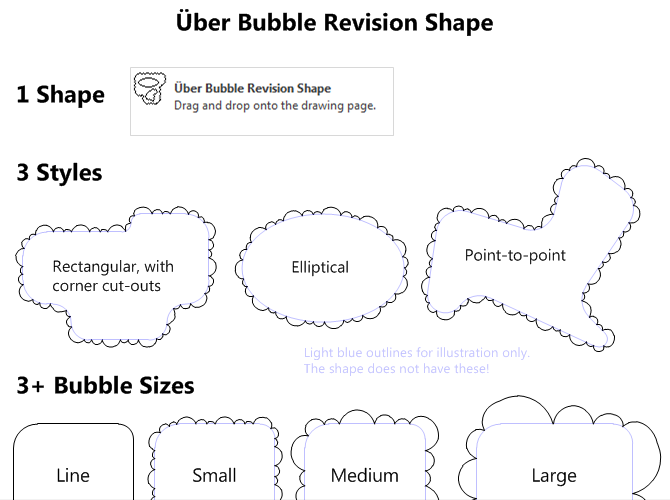 Is there a way to get the same bubble revision shapes in Excel? You could always copy, then paste-as-metafile into Excel, and it *might* work. But you won’t have the nice resizing smarts that you have in Visio. I wonder how hard it is to make custom shapes in Excel that have the little control handles. I can see this being pretty cool in Excel, as you implied! How can I fill it with hatch to show demolition? This version doesn’t accept fills, due to limitations of Visio and the mechanism I’m using to create it. I have a prototype that allows fills, but it is more complicated, and uses VBA code. I haven’t had sufficient free time to publish it, unfortunately. 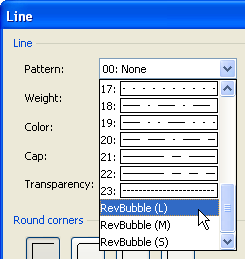 To add to previous requirement, it would be great if the bubble rev convert to AutoCAD. Currently is does not do that.